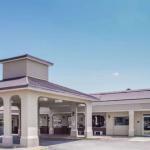 An on-site restaurant and business center free continental breakfast and complimentary Wi-Fi at the pet-friendly Super 8 Augusta fill the bill for our guests traveling to town on a budget. The two-story hotel has 122 rooms with bright decor featuring pillowtop mattresses desks flat-panel TVs with premium cable channels including HBO coffee makers and clock radios. Wi-Fi and local calls are free of charge. Accommodations with microwaves and refrigerators and non-smoking rooms are available by request. Super 8 Augusta has a business center with a computer fax and copy service and an on-site restaurant which is open 24 hours a day. In the morning guests can get a jump on the day with a complimentary continental breakfast. For those who drove to town parking is free. Pets are permitted for an additional fee. Located two-and-a-half miles from Augusta National Golf Club home of the Masters Tournament Super 8 Augusta is a 10-minute walk from Washington Crossing Shopping Center. The Medical College of Georgia Augusta State University Augusta Mall and 1797 Ezekiel Harris Historic House are five miles from the hotel. Downtown Augusta and the historic district Augusta Riverwalk and James Brown Arena are within a 15-minute drive. Augusta Regional Airport is 16 miles away.